Have you ever heard of the parlor game “Six Degrees of Kevin Bacon”? It is a game that can link any one in the Hollywood industry to Kevin Bacon through their film rolls in six connections or less. This can also be done with missionaries- it truly is a small, small world! 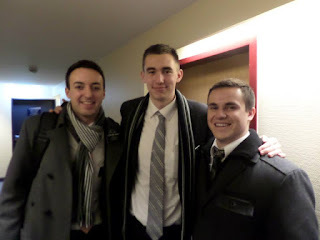 Elder Kyle James has already met people who have served missions with or have had other connections with other St. Johns missionaries in Germany. He even ran into Charly Sauer, a former exchange student from SJHS, at the train station in a large German city. For our seemingly big world, there are truly many, many blessings of connections, love and home! The following is my favorite “Six Degrees of a St. Johns Missionary." Well, I met Josh Melanson when I got transferred to Hillsboro, Oregon. When I met him, he instantly reminded me of myself, sleeping through church, not sure what he was doing there, not sure if it was even true. I remember our first Sunday in the ward. I asked him, “Hey Josh, you want to come out to a lesson with us tomorrow?” He said, "Sorry, I'm busy." I laughed and said, “Your dad told me that you don't have anything to do tomorrow. We will pick you up at ten.” He didn't realize that he had met someone that was just as stubborn, if not more, than him. So we went and knocked on Josh’s door. His mom answered and said he was still sleeping. I said, “No worries; I'll wake him up.” I opened the door and told him he had time to get up, but we were going out and we would be downstairs waiting. He eventually made it downstairs. So we made it a weekly thing, picking Josh up. Then it turned into a daily thing. He was constantly asking questions. He was just like a sponge, learning everything! Then he made the decision to go on a mission. I remember when Elder Hunsaker and I went and watched Josh open his call. He was so excited! His call to the Germany Frankfurt mission was definitely a huge surprise. I knew then, and I still have a sure knowledge to this day, that Elder Josh Melanson was one of the big reasons, if not the biggest, why I was called to Oregon. During the school year, my son, Trevor, came home from Seminary and told me he had just heard one of the best missionary homecoming lessons. Austin Davis just came home and talked about a young man he taught and worked with that later went to the Germany Frankfurt mission. What a cool coincidence! So in my next letter to Kyle, I told him to be on the lookout for an Elder Josh Melanson. A few weeks later, he had been to a zone conference and sent us a picture of himself and Elder Melanson. Pretty neat! A nice connection to home! This touched my heart! Not only did a sweet missionary help our son, but it happened to be the very one who Austin felt he went on a mission to help. This world can be a big, bad, scary place! To find a connection to someone from home can make it all the nicer. What a blessing this simple connection between two St. Johns missionaries has been! I know that our Father in Heaven makes sure that we are taken care of; that we can find help and love from family and friends, even half way around the world. It is a wonderful small town life! It is a wonderful small world, as well. My family was babtized by Richard Lee of St. Johns. We moved there and my husband was the baseball coach, soccer and basketball coach 3 years. My son just returned from a mission he served in Washington. My daughtet married Ryan Humes of St. Johns and now has three beautiful children. It is. a small world. Richard Lee served in Louisville, Ky mission that is now New Albany, IN mission. There is now a temple in St.Louis, MO, Indianapolis, IN, Loiusville, KY, Franklin, TN. We had to travel all the way to Washington D.C. to attend the temple and be sealed. Later a temple was built in Atlanta, Grorgia where I was sealed to Shawn Layden. This is so awesome! I love how the Lord works:) thanks for sharing. What an amazing story. I truly believe that God has a plan for each of us, and we never know how our actions (or someone else's) may be the answer to another's prayers. That's Wyatt Rogers, from Gilbert, AZ, on the right. Fun story! Thanks for sharing.